We’ve having some very hot, sunny weather here in the UK at the moment. By the time you’ve read this, it may well have gone because unfortunately we never have this kind of weather for very long. But it got me thinking about how the seasons affect and inspire our writing. Because whether we’re aware of it or not, the seasons do affect our writing one way or another. For instance, the story we’re telling will always be set in one season or another, even if that season changes. An example of a story where seasons are important is Bridget Jones’s Diary. Being written in the form of a diary, the narrative reflects the changing seasons. Bridget first meets Mark Darcy at her mother’s Christmas party. Then later she goes on a spring mini-break holiday with the dastardly Daniel Cleaver. The author, Helen Fielding, uses the different seasons to move the plot along. Fielding uses Bridget’s mother’s Christmas party, for example, as a plot device so that her heroine is able to meet the hero for the first time. Christmas is a time when families get together, so it’s an opportunity for Bridget to meet Mark when he’s at the party with his parents. 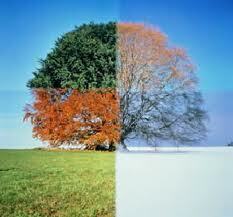 So how can we use the seasons effectively in our writing? Well I was struggling with that a little for a while. In my WIP The Inheritance which I’m hoping to publish soon, the timeline got a little confused. I was using the seasons as the story went along, but one of my beta readers said that it was unclear how much time had passed and what happened when. Using seasonal descriptions can help in our writing provided that we ensure that it’s clear how much time has passed. So in my story I have some of the action taking place around Christmas time and I’ve tried now to make clear that some time has elapsed in the story. I’ve also used the season of Christmas to move the plot along. Things happen around that time that might not have otherwise occurred in the same way. Whatever WIP you’re working on, it’s good to remember that the changing seasons play a part and that as writers we can use them to our advantage. Whether that be to move the plot forward, or drastically change the narrative, possibly by losing a few characters, it’s important to remember that seasons affect many aspects of our writing. If you would like to take part in Thursday’s Children, simply write a blog post about whatever inspires your writing. Then add your name to this linky. Thanks to Rhiann Wynn-Nolet and Kristina Perez for hosting. Great post! I do love a good seasonal story. Christmas stories make me feel all warm and cozy. I love to think of the seasons as metaphors. My WiP takes place in the summer–the season of growing and ripening, which is what happens to my character emotionally. Thanks for the post! I loved Bridget Jones’ Diary, but I never connected the seasons to her personal growth before…until now. I should have. Duh. Thanks for the reminder that we writers should use every detail to enliven our stories. I love changing seasons in real life and agree they can add a lot to the story. Since Halloween is my favorite holiday (and my anniversary), it’s been a turning point in two of my books. So far. It’s interesting to me how when the seasons change, my mindset changes a bit too, particularly when autumn becomes winter. It’s as if my body clock is saying ‘it’s winter now – time to hibernate’ and I can get a bit morose when I realise winter is coming. The seasons are always very important in my writing. It’s funny because living here in Hong Kong and soon moving to Singapore where there are no seasons it makes me appreciate their symbolism even more. Thanks for joining us!